hings To Do is a segment designed to provide students with information about locations and businesses that are accessible to a collegiate budget. ICS Student Lobby Day Page 7 WANT MORE CONTENT? 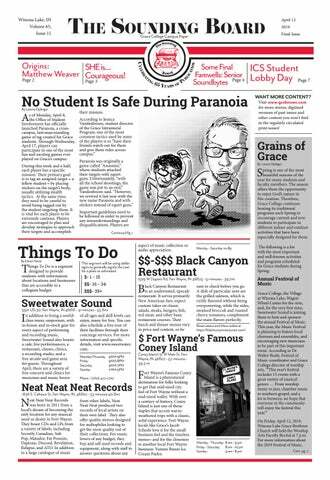 Visit www.gcsbnews.com for more stories, digitized versions of past issues and other content you won't find in the regularly circulated print issues! pring is one of the most beautiful seasons of the year for many students and faculty members. The season offers them the opportunity to enjoy God’s nature in His creation. Therefore, Grace College continues hosting its traditional programs each Spring to encourage current and new students to participate in different indoor and outdoor activities that have been especially designed for them. aspect of music collection or audio appreciation. ort Wayne’s Famous Coney Island is a phenomenal destination for folks looking to get that mid-sized city feel of Fort Wayne without a mid-sized wallet. With over a century of history, Coney Island is just one of those staples that accent warmweathered trips with a classic, solid experience. Fort Wayne locals like Grace’s Jacob Scheele love it for the small business feel and the timeless menu-- and for the closeness to another local Fort Wayne business: Yummi Bunni Ice Cream Parlor. not allowed to tag their targets indoors or in/from vehicles. Also, no tags are allowed during Grace-sponsored events. Students cannot tackle their targets, tag them during work hours or while they are playing/practicing athletics. The Joust is one of the most well-known traditional programs organized by Grace College every Spring. The Joust is a four-day tournament. The students are divided into different teams and they have to compete against each other in different contests. Board games, Spelling Bee, wiffle ball, capture the flag, and several other games are part of this competition. dubbed “The Purge.” The hour has not been confirmed yet, but it is expected to be announced via the Paranoia message group. Breath of Life Haiti Gala” from 6:00-8:30 p.m. This event is Caribbean-themed; anyone can purchase tickets online for $50 per couple. On July 27 in the Village, there will be a jazz festival for local music lovers to enjoy. At the event, there will be many food trucks as different groups and ensembles perform. With summer right around the corner, make sure to check your calendar and head back to the area with your friends to enjoy all the festivities that Winona Lake has to offer. a friend tried to prank his roommate with a live lobster. always been an overachiever; as an adolescent, she wanted to be the best of the best. However, she discovered that her friends didn’t like that quality about her. Alessa Tracy shares advice she learned about being courageous when she was young. their responses. If you’re a graduating senior and have a piece of advice you would like to share, send it, along with a picture of yourself, to horste1@grace.edu. rust in God’s plan and God’s timing because it’s all gonna turn out pretty great. It’s gonna be hard but you're going to make great friends and experience some amazing things. Also, stay away from almond milk, it’s just water trying to be milk! on’t sweat the petty stuff and don’t pet the sweaty stuff. on't be afraid to get involved. Trust God wholeheartedly. Take advantage of living so close to all your friends. Brendan Hamilton N ever break two laws at once, that's how you get caught. ne of Grace College’s event management teams, supervised by Professor Erica Elliot of the business department, hosted a Nerf Gun Tournament on Saturday, March 30, from 2-4 p.m. The proceeds from the event went to support Fellowship Missions, a homeless shelter located in Warsaw. In order to raise money and increase awareness for Fellowship Missions, students Caleb Ware, Natalee Cross, Zoey Crane and Rachel Starrett worked together to construct a Nerf gun tournament inside of McClain, utilizing the entire building. as possible to construct a complex field of play for the tournament. This was no easy task; every classroom was built differently, featuring themes such as prisons and military bases. Roughly 20 people signed up to play play a variety of Nerfcentric game modes, namely capture the flag and last man standing. During capture the flag, both teams were armed and sent out to capture the enemy’s flag while simultaneously guarding their own. The tournament ended with a round of “Last Man Standing,” an all-out battle royalestyle game of every man for himself. After a few hours of simulated warfare, the last three participants standing won an Amazon gift card on top of their bragging rights. race College’s Counseling Center has announced that they will be hosting weekly events called “Express Yourself.” These events will allow students to de-stress as the school year ends. the mediums used included drawing with markers, crayons and pencils. where he coached for five seasons. investing in the lives of the players in the program for years to come.” Patrick takes the helm of one of the most successful programs in NAIA history. Grace has racked up 502 all-time wins, seventhmost among NAIA institutions. The Lancers won 15 games in 2018, the most in program history since 1983. Eye On Missions Don’t Leave Deaf Ministry to the Non-Profits W By Lyndsey Koh hen it comes to ministry, it’s easy for Christians to leave the outreach to pastors and nonprofits. When it comes to the deaf community, the sign language barrier can be pretty daunting — enough to turn away would-be sharers of the Gospel. engaged with the Gospel. The same statistics have generally been shared about the deaf community here in the US, saying that that around 98 percent don’t really know the Gospel message,” Bucklew explains. In Tajikistan, Christians are Government Targets By Katey Hearth ressure continues to build on Christians in Tajikistan. using laws to make sure that Christians can’t share their faith with their children.” Along with the incident described earlier, Tajik Christians spoke with Institute of War and Peace Reporting (IWPR) about the oppression and uncertainty they encounter daily. On its website, Open Doors USA describes how Christian persecution is escalating throughout Central Asia. Along with meeting the immediate needs of persecuted Christians, Open Doors continues to support the local church in Tajikistan and other central Asian nations. “No matter where you live,” Curry says, “there are a couple of easy ways you can help persecuted Christians in Tajikistan. Share these powerful stories on social media so that the Christian Church wakes up to the things that are going on in the world. Then, let them pray.” Pray that governmental pressure would lessen, and Tajikistan would become more open to Christianity. Pray for church leaders who are faced with the stress and anxiety of raids and arrests. Ask God to give them courage, wisdom and discernment as they serve the Body of Christ. “The local Church has been tasked with Scripture engagement — meaning to make disciples, to plant churches, [and] to do this work in their community,” said Bucklew. “It isn’t my place or the Deaf Bible Society’s place to come in and bypass the Church. What we’re here to do is to say, ‘How can we equip you and give you the tools and resources you need to do better ministry?’” Bucklew lists a few ideas for you to start engaging the deaf in your area. In Tajikistan, Christians are Government Targets By Beth Stolicker nternational Media Ministries, based in Madrid, Spain, is dedicated to training Christians across the globe to use media to tell their stories and share the Gospel. The mission: to get Jesus on every screen. “Right now, our niche is to create dramas, whether that’s a micro-drama of two-minutes for social media or a full drama that’s going to be broadcast on a satellite channel,” says Denise Godwin, President of International Media Ministries. Currently, IMM has projects in the works which tell the story of the early Church. Godwin says it is important to share these stories because the early Church shaped how we cope with persecution today, how we love one another and how we cope with outside stresses. partnerships involve translation, product development and follow-up work. However, each one of these partnerships has the goal of ensuring that the national church can use the final works for conversations which lead to Christ. Through its training, IMM teaches people how to create stories with the tools available to them, like a mobile device. IMM also teaches Christians how to engage with and develop their media outreach by sharing their stories with their people. However, sharing a video on social media is not enough. That is why IMM does strategy training to empower national Christians to strategically use media to share Christ. early 1980s, some people came to IMM for media and television training. Today, these same people work with national television in Iceland. Another story Godwin remembered is about a national church IMM trained. This national church eventually grew to have its own radio station and TV channel. Today, it is run by locals. These stories are exactly what IMM works towards—Christians who are empowered to use media to share the Gospel in their cultures. “We’re not involved at all anymore, but it’s empowering people to communicate with their own people. That’s a marvelous tool to give to someone to have in their own culture,” Godwin says. that would require at least 30 percent of the voters’ approval to pass any projects. Lastly, Rep. Wolkings discussed with the students the importance of providing more childcare centers in this community, but to make this possible, some of the buildings around this area need to comply with the state regulations. Above: (Back, L to R)Kearstin Criswell, Olivia Bottorff, Lorena Oplinger, Jared Burkholder, (Front, L to R) Hannah Gray, Ericka DeBoes, Anna Steely, and Jalen Posy spent the day at the State House for the ICI Student Lobby Day on April 9, 2019. What has an eye but cannot see? A storm! Generated by http://www.opensky.ca/sudoku on Tue Apr 9 19:57:26 2019 GMT. Enjoy! Generated by http://www.opensky.ca/sudoku on Tue Apr 9 19:57:29 2019 GMT. Enjoy! Generated by http://www.opensky.ca/sudoku on Tue Apr 9 19:57:34 2019 GMT. Enjoy! Generated by http://www.opensky.ca/sudoku on Tue Apr 9 19:57:36 2019 GMT. Enjoy! soundingboardsoundingboardsoundingboardsoundingboardsoundingboard The Sounding Board exists to provide Grace College students with a voice. The newspaper will contain articles which inform, stimulate thought, present various student opinions and provide entertainment. Accuracy, truth, fairness and professionalism are the highest priorities of the student staff members. The editors reserve the right to review all submissions to the newspaper to ensure they are God-honoring and meet the legal and ethical standards of a responsible press. Editorials and opinions are those of Grace students and may not necessarily represent the official view of the administration of Grace College. 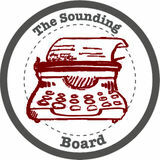 The Sounding Board encourages and welcomes editorial letters from students, faculty and staff. This is to provide everyone with the opportunity to voice his or her thoughts and opinions. Letters must be signed, although names may be withheld for justifiable reasons. Please send letters to the Sounding Board staff at soundingboard@ grace.edu. You can also find us at www.gcsb.com for more content and archives of previous issues. The Sounding Board is printed in cooperation with The Papers, Inc. and is a member of the Evangelical Press Association (EPA) and the Associated Collegiate Press (ACP).